These RED Mangroves (Rhizophora mangle) are great for tank Nitrate filtration or for landscaping. They are able to survive in salt, brackish, and fresh water. The propagules are not harvested from public shorelines, they are grown privately. We offer a two month survival guarantee. The plants you will receive will have established roots with at least two leaves. Most plants will be around 14" in height with an absolute minimum of 12 inches. We offer free shipping and the Mangroves are sent out within 24 hours of purchase. Care instructions: Remove the plants from the shipping material. The temperature of this tropical plant should not drop below 40 degrees. Tank- Gently rinse them in room temperature fresh or tank water if you are placing them in an aquarium. Do not pack the roots down. Provide at least 12 hours a day of bright, daylight-spectrum light from a lamp or overhead light. 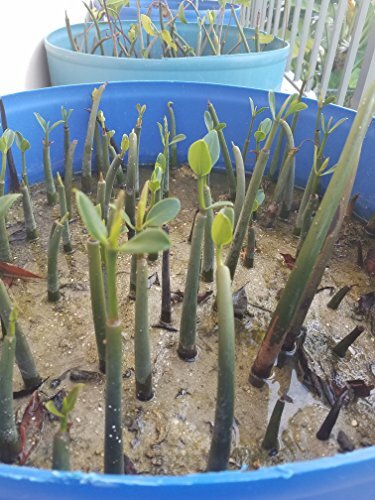 The leaves need to be rinsed and cleaned everyday if the Mangrove is in a saltwater. If they begin dropping leaves, then it is not getting rinsed enough. They need to dispose of the salt through their leaves. Pot Planting- Cover their roots with soil, add fertilizer. Make sure their roots stay moist. They require filtered light. Please keep in mind, Mangroves don't tolerate full sun very well they thrive better in the shade. Mist them once a week if they are indoors. Suitable for indoor/outdoor pot planting, aquariums, and hydroponic gardens. If you have any questions about this product by Red Mangrove - Rhizophora mangle, contact us by completing and submitting the form below. If you are looking for a specif part number, please include it with your message.